KBF Members can pit their skill against other kayak bass anglers in regional tournaments. KBF TRAIL Series Tournaments are qualifying events for the five 2019 KBF TRAIL Series Regional Finals, the 2019 KBF TRAIL Series Championship (October 18–19 on the Mississippi River near La Crosse, Wisconsin) and the 2020 KBF National Championship (April 2–4 on Lake Guntersville, Alabama). Entry fees for KBF TRAIL Series Tournaments and Regional Finals remain at $75 for 2019. The KBF TRAIL Series Championship Entry Fee will be $150. 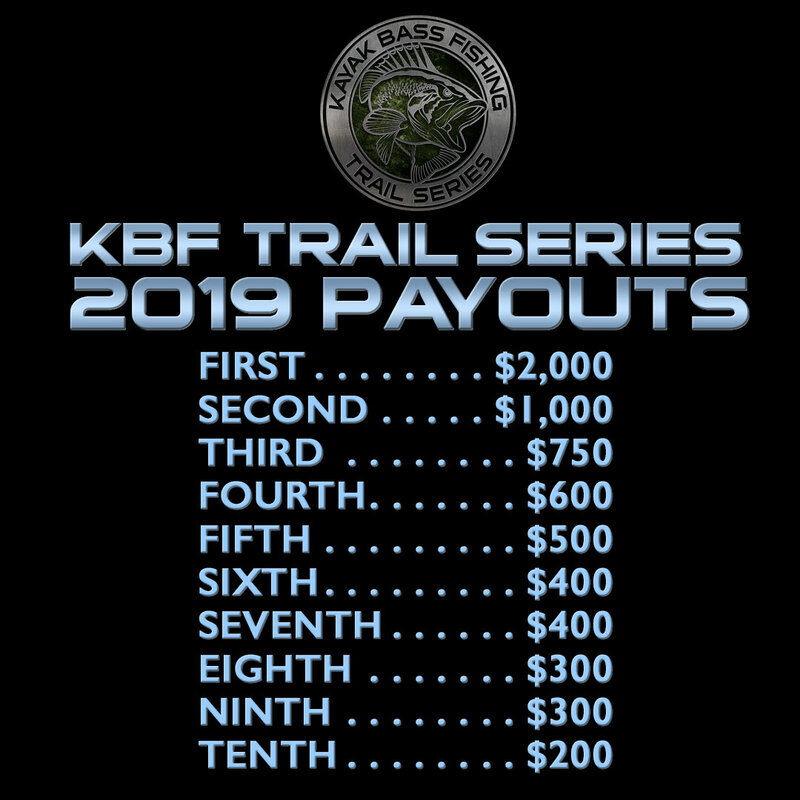 At each 2019 KBF TRAIL Series Tournament, the top ten in rank split $6,450 in cash, regardless of the number of registrants. 2019 KBF Angler of the Year Points will be awarded according to performance to every KBF Member who registers to compete in TRAIL Series Tournaments. First Place earns 600 AOY Points, Second place 595, Third 590, and so on, dropping by 5 points with each step down in rank. 120 points is the minimum awarded to any Active Participant. If one registers but doesn’t compete, 60 Registration AOY Points are awarded. 2020 KBF-NC Qualification—KBF TRAIL Series Tournaments are qualifying events for the 2020 KBF National Championship. One qualification will be awarded to the top 10% in rank (rounded to the nearest 10), with a minimum of ten. No roll-downs if awarded to one who has previously qualified. • 75-84 Registrants (rounds to 80): top 8 places qualify. etc. KBF TRAIL Series Regional Final Qualification—KBF TRAIL Series Tournaments are also qualifying events for the 2019 KBF TRAIL Series Regional Final. One qualification will be awarded to the top 10% in rank (one for every ten registrants), with a minimum of ten. No roll-downs if awarded to one who has previously qualified. KBF TRAIL Series Championship Qualification—KBF TRAIL Series Tournaments are qualifying events for the 2019 KBF TRAIL Series Championship, too. Qualifications will be awarded to the top 10% in rank (one for every ten registrants), with a minimum of ten. No roll-downs if awarded to one who has previously qualified. 2020 KBF TENvitational Qualification: KBF TRAIL Series Tournaments are qualifying events for the 2020 KBF TENvitational. Qualifications will be awarded to the top 10% in rank (one for every ten registrants), with a minimum of ten. No roll-downs if awarded to one who has previously qualified. Mystery Bass BONUS BUCKS—This special bonus, starting at $50, grows with each TRAIL Series Tournament until claimed and then starts over at $50. 3. The TD identifies a photo of the Mystery Bass score that was submitted during the randomly selected competition hour. Ties are broken in favor of the first competitor who submitted a photo of that score. If the competitor who submitted that photo it is enrolled in KBF BONUS BUCKS – TRAIL, he’s awarded $50 (or the amount to which the bonus has grown by that event). 4. If a Mystery Bass Bonus is unclaimed, then the bonus is added to the bonus at the next KBF TRAIL Series Tournament. For example, if a $50 bonus is unclaimed, the next week’s Mystery Bass Bonus would be worth $50 + $50. Multiple KBF TRAIL Series Tournaments on the same day all benefit equally, so if there are three such tournaments the following weekend, $100 is up for grabs at all three. The number keeps climbing until claimed…possibly all the way to $1,500 by the last KBF TRAIL Series Regional Final. Who came up with this year’s schedule? 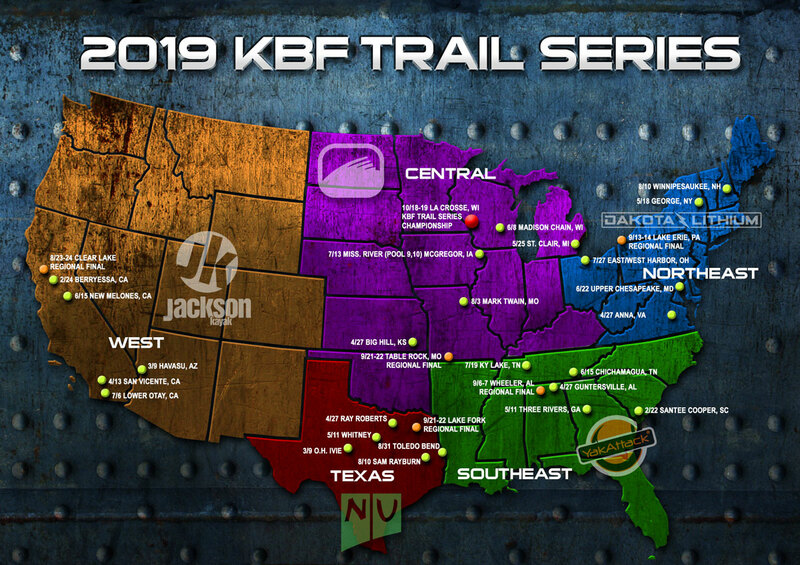 The 2019 KBF TRAIL Series Schedule came about as a team effort from KBF Partner Tournament Directors from across each region. Certain concessions had to be made to get to where we needed to be on the overall TRAIL for what we could afford to do in 2019. Scheduling 40+ TRAIL Series Tournaments again, as KBF did in 2017 and 2018, just wasn’t feasible. Can anyone fish a KBF TRAIL Series Tournament in 2019? Well, yes…but only if he becomes a KBF Lifetime Member or 2019 KBF Competitor Member (Standard, Military, or Student). Non-members must pay their KBF Competitor Membership Dues (and KBF Ambassador Members must upgrade to Competitor membership) by midnight before competition to be eligible to register and compete. Why are there no TRAIL Series Tournaments in my state? Can I compete in more than one region? Yes, you may, and regardless of region, your top three AOY points rankings contribute to your Angler of the Year standings. If you’re trying to qualify for a particular region’s Championship, the top three scores you earn in that region count. For example, if Kim fishes three TRAIL events (two in Southeast and one in Northeast Regions), his AOY points total will be the sum of points earned in those three TRAIL tournaments. If his goal is to qualify for the Southeast KBF TRAIL Regional Championship, he’s going to be at a disadvantage compared to KBF Members who fish three or more KBF TRAIL Series Tournaments in the Southeast Region. He still has a shot, but it’s a long one. What is the minimum number of registrants required in 2019 for a KBF TRAIL Series Tournament to “make”? There’s no minimum. The payouts are guaranteed regardless of the number of registrants. Are KBF BONUS BUCKS awarded at KBF TRAIL Series Tournaments? Yes. KBF BONUS BUCKS cash bonuses of $300, $200 and $100 are available to the top three finishers, providing they’re enrolled in KBF BONUS BUCKS-TRAIL. In addition, there’s a Mystery Bass Bonus worth $50 at each TRAIL Series Tournament, and if it’s unclaimed the amount grows in subsequent TRAIL events. Over 30, that adds up to another $1,500 in cash bonuses that will paid out—and not necessarily to the top finishers in each event. Are Sponsor BONUS BUCKS awarded at each KBF TRAIL Series Tournament, too? 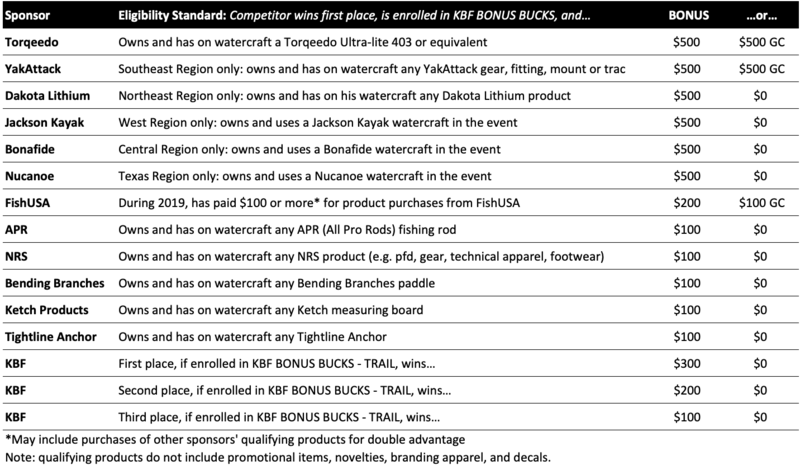 Yes, for every TRAIL Seres Tournament and Championship, KBF Sponsors will award cash or Gift Cards to BONUS BUCKS participants who place at the top in competition. How does a KBF Competitor Member qualify for a KBF TRAIL Series Regional Final? b.) Qualify by AOY Points earned in KBF TRAIL Series Tournaments (top scores of up to three TRAIL Series Tournaments in the Region. c.) There will be a qualification process whereby KBF Partners can qualify KBF Members in their organizations, too. Details will be posted here when we have them. For how many KBF TRAIL Series Regional Finals can one qualify? Since two of them fall on the same weekend, four KBF TRAIL Series Regional Finals is the most anyone could possibly attend. A KBF Member could possibly win a TRAIL Series Tournament in three or four different regions and thereby qualify for three or four Regional Finals, though it’s not very probable. If one fishes three KBF TRAIL Series Tournaments in one Region and three in another, or wins two TRAIL Series Tournaments in different regions, he would very likely qualify for two regions.That’s more likely to happen. Must all AOY Points be earned in the same region? No. Points a KBF Member earns at his top three-scoring KBF TRAIL Series Tournaments count toward his 2019 KBF AOY Points total. Ditto for Regional Finals; if one fishes more than one championship, only the top score contributes to his AOY Points total. Does the payout vary with the number of registrations? No. $6,450 will be awarded at each KBF TRAIL Series Tournament. KBF’s break-even point on Entry Fees and Payouts (after credit card transaction fees, tournament management system charges, judging & admin costs) is about 100 participants. If the number of registrations exceeds 100, does the payout increase? What do we see happening with the KBF TRAIL Series down the road? For one, we may need to split the Southeast Region into SE West and SE East. Florida may need to be its own region, as Texas is in 2019. Kristie is has some premium Florida events in the works that promise not only exciting kayak bass tournament action but vacation opportunities for anglers and their families. KBF is also working on ways to tie the KBF Partner Program into the Regional KBF TRAIL Series Championships.